The controller has remained relatively unchanged throughout time. 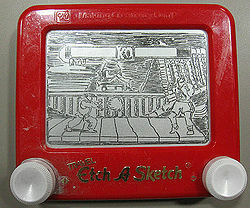 The graphics of the NES were highly advanced for the era. ~ Captain Obvious on Super Mario Bros. 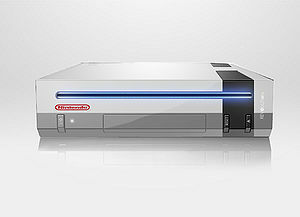 The NES (Nintendo Entertainment System) was Nintendo's first video game console. Released almost 30 years ago way back in 1985 (yes, you're getting old), the NES was the first console in which the objects in its games actually represented what they were supposed to be. The console's enormous library of classics, such as Action 52 and Knocked off Another Goddamn Ledge, continues to be very popular with masochists. The idea for the console came about in 1984 after a man named Mario managed to trap pure power within a small box, without an explosion occurring. Nintendo's sneaky execs obtained Mario's box of power, and made multiple replicas of Mario's box of power, which they named NES, without Mario's consent, infuriating him. After a Nintendo employee named Shigeru Miyamoto gained intel on Mario planning to kill now-former Nintendo president Hiroshi Yamauchi in a fit of revenge, Shigeru snuck up to a sleeping Mario one night and shoved him inside of an NES. Now, Mario spends eternity forced to obey the whims of 7-year-olds everywhere, who guide him into lava pits and man-eating flora through Nintendo's Entertainment Systems, as well as other platforms. Fortunately, Nintendo was kind enough to warn those who played the NES that they were actually playing with power. Nintendo Power. 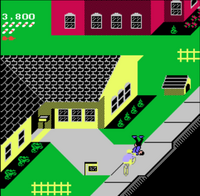 Such NES games, such as PaperBoy, contained quite risque scenes for the time, notably a man in the middle of a sidewalk struggling to put on his pants while a young boy bicycles by. Children were unable to play an NES while their parents are out, the reason being that there was no one to help them hook it up. However, the console, and its pack-in robot creatively named ROB (Robotic Operating Babysitter), would use magical evil magic to send x-rays from the moon into childrens' eyes through televisions to make them hallucinate playing NES. Since an NES console was also sentient, its life force (AKA power) would naturally weaken over time, and the console would only start up if given oral stimulation, which could be delivered by blowing into its mouth. Nintendo Power is the name given to the sole material found within an NES, with an atomic number of 128. Unique among other element names is that the name is trademarked. Nintendo Power is said to be similar in composition to gold, cobalt, wood, and viagra. Nintendo later used the name Nintendo Power for a series of magazines that discussed NES and Game Boy games. Intelligently, Nintendo told several game companies to make their games so impossible to complete that players, in an era before the World Wide Web, had to get Nintendo Power in order know how to beat that one level. Which meant cash, cash, cash for Nintendo. Game Park mini - the handheld console that rendered the NES obsolete! iPodendo - A product spinoff of the iPod as a result of a joint venture between Apple Computer and Nintendo. One of the well-known side effects to playing NES. This page was last edited on 18 October 2012, at 02:50.